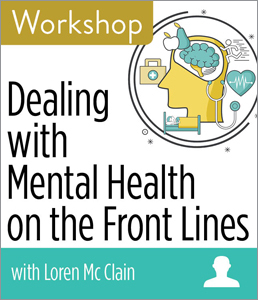 CHICAGO—ALA Publishing eLearning Solutions announces an exciting new workshop, Dealing with Mental Health on the Front Lines with Loren Mc Clain. This workshop will consist of two 90-minute sessions and take place at 2:30pm Eastern/1:30 Central/12:30 Mountain/11:30am Pacific on Thursdays, March 7 and 14, 2019. Like CPR, providing first aid to someone experiencing a mental health crisis is about knowing how to respond to a person in crisis and connect that person with help. First aiders do not take on the role of professionals—they do not diagnose or provide any counseling or therapy. Instead, by bringing awareness to the community at large and offering concrete tools and answering key questions, like “what do I do?” and “where can someone find help?”, you can help assist people in crisis when needed and can use additional tools and resources to develop a culture that is supportive to its community. This workshop will help you see the prevalence of mental illness in your place of work and community at large. With the statistics provided in the workshop, you will learn how detrimental mental illnesses can be to society and the productive workforce culture. By understanding the basics of mental illnesses and disorders in the workplace and in the community, you can gain a better understanding of how your library’s policies and procedures come into play, and how you can adapt a more positive and supportive environment for your employees and the public. Loren Mc Clain is an Academic Advisor at American Public University System, in Manassas, VA. Until recently, she worked at the Muncie Public Library in Human Resources and Public Relations. In addition, Loren is a Certified Instructor for the National Council for Behavioral Health and Mental Health First Aid USA. The National Council for Behavioral Health and Mental Health First Aid USA strives to promote awareness of mental health and break the stigma associated with mental health issues and continues to demonstrate their awareness and commitment to the “Be the Difference” pledge. Moreover, due to her persistence to bring MHFA to libraries in Indiana, Loren was inducted into the 2018 Indiana State Library Leadership Academy cohort, where she implemented a project that focuses on bringing mental health awareness and coping techniques to libraries across the state and nation.